Capuchin monkey is the common name for the tropical New World monkeys comprising the genus Cebus of the primate family Cebidae, characterized by a hairy, prehensile tail, and a darkly colored body, arms, and legs, with a white face, throat, and chest, and a dark cap on the head. Their common name comes from their coloration and their cap of crown hair, which resembles the cowls worn by the Franciscan Capuchin order of Catholic friars. Cebus is the only genus in subfamily Cebinae. 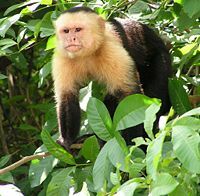 The range of the capuchin monkeys includes Central America (Honduras) and middle South America (middle Brazil, eastern Peru, Paraguay). Sometimes capuchins plunder fields and crops and are seen as troublesome by nearby human populations. In some regions they have become rare due to the destruction of their habitat. Capuchins are considered among the most intelligent New World monkeys. Easily recognized as the "organ grinder" monkeys, capuchins, which are diurnal, are sometimes kept as exotic pets, and they are also sometimes used as service animals. Some organizations have been training capuchin monkeys to assist quadriplegics in a manner similar to mobility assistance dogs. After being socialized in a human home as infants, the monkeys undergo extensive training before being placed with a quadriplegic. Around the house, the monkeys help out by doing tasks including microwaving food, washing the quadriplegic's face, and opening drink bottles. Beyond these values, capuchins add to the human wonder of nature, are used in laboratory research, and are a key part of tropical food chains. Capuchin monkeys are New World monkeys. New World monkeys are one of three major informal groups of the biological order Primates, the other two groups being (1) prosimians and (2) monkeys and apes of the Old World. Together, the New World monkeys and the Old World monkeys and apes are considered to be "higher primates," or simians (infraorder Similformes), while the prosimians (such as lemurs) are considered to be the "lower primates." The term monkey thus refers to any simian that is not an ape or any primate that is neither an ape or a prosimian. In reality, monkeys are not a single coherent group and therefore do not have any particular traits that they all share.The New World monkeys are found in Mexico, Central America, and South America, and the Old World monkeys are located in Africa, central to southern Asia, Japan, and India. There are four families of New World monkeys: Cebidae, Aotidae, Pitheciidae, and Atelidae (Groves 2001). The four families are ranked together as the Platyrrhini clade. All New World monkeys differ slightly from Old World monkeys in many aspects, but the most prominent of which is the nose. This is the feature used most commonly to distinguish between the two groups. The scientific name for New World monkey, Platyrrhini, means "flat nosed," therefore the noses are flatter, with side facing nostrils, compared to the narrow noses of the Old World monkey. Most New World monkeys have long, often prehensile tails. Many are small, arboreal (live in trees), and nocturnal (active at night). Unlike most Old World monkeys, many New World monkeys form monogamous pairs, and show substantial paternal care of young. Capuchin monkeys belong to the Cebidae family with the marmosets, tamarins, and squirrel monkeys. Capuchins reach a length of 30 to 56 centimeters (12-22 inches), with tails that are just as long as the body. They weigh up to 1.3 kilograms (2 pounds, 13 ounces), with brains of mass 35-40 grams. Capuchins generally resemble the friars of their namesake. Their body, arms, legs and tail are all darkly (black or brown) colored, while the face, throat and chest are white colored, and their head has a black cap. The diet of the capuchins is more varied than other monkeys in the family Cebidae. They are omnivores, eating not only fruits, nuts, seeds, and buds, but also insects, spiders, bird eggs, and small vertebrates. Capuchins living near water will also eat crabs and shellfish by cracking their shells with stones. Among the natural enemies of the capuchins are large falcons, cats, and snakes. Capuchins live together in groups of 6 to 40 members. These groups consist of related females and their offspring, as well as several males. Usually groups are dominated by a single male, who has primary rights to mate with the females of the group. Mutual grooming as well as vocalization serves as communication and stabilization of the group dynamics. These primates are territorial animals, distinctly marking a central area of their territory with urine and defending it against intruders, though outer zones of these areas may overlap. Females bear young every two years following a 160 to 180 day gestation. The young cling to their mother's chest until they are larger, when they move to her back. Adult male capuchins rarely take part in caring for the young. Within four years for females and eight years for males, juveniles become fully mature. In captivity, individuals have reached an age of 45 years, although life expectancy in nature is only 15 to 25 years. Capuchins are considered among, if not the most intelligent New World monkeys and are often used in laboratories. The tufted capuchin is especially noted for its long-term tool usage, one of the few examples of primate tool use other than by apes. Upon seeing macaws eating palm nuts, cracking them open with their beaks, these capuchins will select a few of the ripest fruits, nip off the tip of the fruit and drink down the juice, then seemingly discard the rest of the fruit with the nut inside. When these discarded fruits have hardened and become slightly brittle, the capuchins will gather them up again and take them to a large flat boulder where they have previously gathered a few river stones from up to a mile away. They will then use these stones, some of them weighing as much as the monkeys, to crack open the fruit to get to the nut inside. Young capuchins will watch this process to learn from the older, more experienced adults. During the mosquito season, capuchins crush up millipedes and rub the remains on their backs. This acts as a natural insect repellent. When presented with a reflection, capuchin monkeys react in a way that indicates an intermediate state between seeing the mirror as another individual and recognizing the image as self. With scenario 1, females appeared anxious and avoided eye-contact. Males made threatening gestures. In scenario 2, there was little reaction by either males or females. When presented with a reflection, females gazed into their own eyes and made friendly gestures such as lip-smacking and swaying. Males made more eye contact than with strangers or familiar monkeys but reacted with signs of confusion or distress, such as squealing, curling up on the floor, or trying to escape from the test room (de Waal et al. 2005). The question of whether capuchin monkeys have a theory of mind—whether they can understand what another creature may know or think—has been neither proven nor disproven conclusively. If confronted with a knower-guesser scenario, where one trainer can be observed to know the location of food and another trainer merely guesses the location of food, capuchin monkeys can learn to rely on the knower (Kuroshima et al. 2002). This has, however, been refuted as conclusive evidence for a theory of mind as the monkeys may have learned to discriminate knower and guesser by other means (Heyes 1998). Non-human great apes have not been proven to develop a theory of mind either; human children commonly develop a theory of mind around the ages 3 and 4. ↑ 1.0 1.1 C. Groves, "Order Primates," "Order Monotremata," (and select other orders). Page(s) 136-138 in D. E. Wilson and D. M. Reeder, eds., Mammal Species of the World, 3rd edition, Johns Hopkins University Press (2005). ISBN 0801882214.
de Waal, F. B., M. Dindo, C. A. Freeman, and M. J. Hall. 2005. The monkey in the mirror: Hardly a stranger. Proceedings of the National Academy of Sciences 102(32): 11140-11147. PMID 16055557. Retrieved December 11, 2007. Heyes, C. M. 1998. Theory of mind in nonhuman primates. Behavioral and Brain Sciences. Retrieved December 11, 2007. Kuroshima, H., K. Fujita, A. Fuyuki, and T. Masuda. 2002. 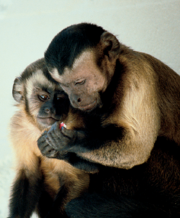 Understanding of the relationship between seeing and knowing by tufted capuchin monkeys (Cebus apella). Animal Cognition 5(1): 41-48. Retrieved December 11, 2007. Mendes Pontes, A. R., A. Malta, and P. H. Asfora. 2006. A new species of capuchin monkey, genus Cebus Erxleben (Cebidae, Primates): Found at the very brink of extinction in the Pernambuco Endemism Centre. Zootaxa 1200: 1-12. Retrieved December 11, 2007. Primate Info Net Cebus Factsheets. This page was last modified on 9 January 2017, at 16:52.